Saturday Jeffrey and I were watching a movie (War Games) on the laptop while cuddling on the bed. and we were both rather enthralled with what was going on in the movie. A spider suddenly ran off the keyboard and onto the bed. Jeffrey jumped up, and we turned on the light. We looked on the floor, all around and even under the lappy. So we resumed the movie. He didn't believe that I had actually seen a spider. About five minutes later I felt something on my back. My first thought was it was Jeffrey's hand just lightly brushing my back. I then made an accounting for his hands. One was around me, and the other was supporting his head. That means it wasn't him. We turned on the light, and looked at the bed again. 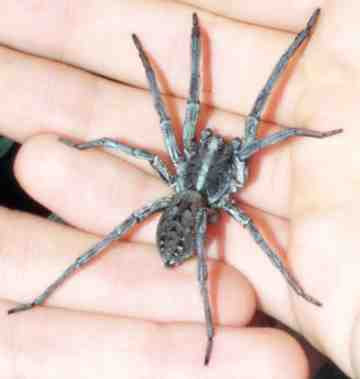 A freaking wolf spider was running across my back! I have no idea how it got from the computer to my back and I refuse to think about it. Don't get me wrong, I am not a spider hater. I don't mind spiders if they are minding their own business. The second they start crawling across me in the dark, I become the biggest antagonist that spider has ever known. After the screaming stopped, I looked at it, grabbed a piece of paper and turned it over, and then Jeffrey took the paper and killed it. The whole rest of the night every time i got an itch I thought it was another spider. Oh. my. gosh. Gross! I definitely feel your pain and if that is the exact, offensive spider... I am so sorry. It's huge! Now I feel all itchy. I'm glad you killed it!! Ew gross! I shuddered when I saw the pic of that spider. It was huge! Oh super nasty! That totally freaks me out I'm going to be double checking my bed for weeks! Woah! I would have reacted the same way. There are supposed to be a lot of bugs here, but we haven't seen many of them. I'll just count my blessings. BLUHHHHHH, SHUDDER, i hate spiders. i did a post a LONG time ago, like oct b/c i found several black widows in one week in my house. i vowed to never go more than 6 months without spraying my handy dandy home defense. walmart, in the biggest container they've got. Yah, and that was really huge! Ack! I loathe, despise, and abominate spiders. I really do. I would have been screaming there right along with you. ew thats a creepy picture.